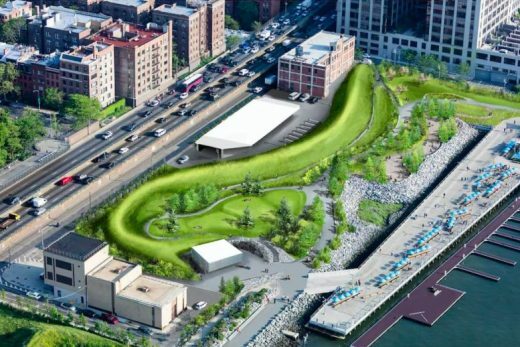 A new stretch of Brooklyn Bridge Park, which straddles the mouth of the East River along Brooklyn Heights, will come online later this year, reports newyorkyimby.com. 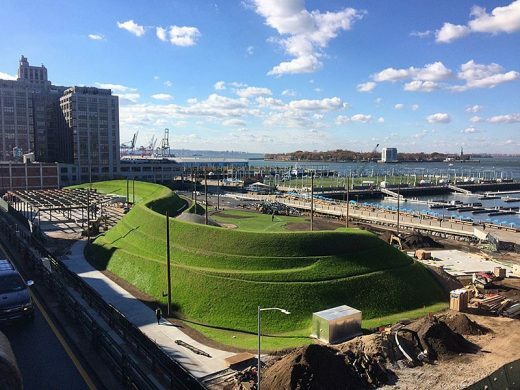 Renderings of the six-acre plot, called Pier 5 Uplands and located between Joralemon and Montague streets, have been revealed at Curbed NY. The new public park space will feature a 35-foot-tall bern, lawns, new vegetation, a “rain garden,” seated areas, and paved pathways. Along Furman Street, there will be a single-story building constructed for the park’s operations. Another, smaller boathouse structure will be built for with community facility space and restrooms. Michael Van Valkenburgh Associates is the landscape architect and Architecture Research Office (ARO) is responsible for the new buildings. 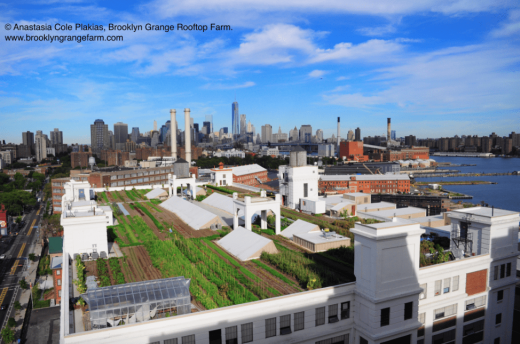 Website: Pier 5 Uplands Brooklyn Bridge Park – article in Curbed NY. Design: James Carpenter Design Associates Inc. The Pier 5 Recreational Building, a multiuse recreation building, is a vital element of the Brooklyn Bridge Park Master Plan, an activity beacon offering space for sports and community events year round and acting as a landmark within the park, visible from the Brooklyn-Queens Expressway, the Brooklyn Heights Promenade, and Lower Manhattan. The building’s location on Pier 5 will bring life and activity to the south end of the park, and its adjacency to the Joralemon Street and Atlantic Avenue entries will ensure convenient access to the facility by the public. The structural and transparent properties of soap bubbles are an important point of reference for the Brooklyn Bridge Park roof concept (Soap bubble having the shape of a spherical segment (3/4 sphere on a rigid circular boundary)). The delicate structure of the steel building frame is designed to withstand external natural forces without adding additional pile supports to the pier, while the enclosing skin has been specifically designed to optimize and control solar conditions, prevailing winds and dramatic views of the harbor and Lower Manhattan at the activities of the harbor. The horizontal steel roof trusses span 220′ with a 10′ depth at the mid-span, maintaining an extremely slender profile in elevation in order to maximize ball clearance. The west and east walls are highly transparent insulated glass units that allow extraordinary views into and out of the building’s envelope, and the north and south walls are translucent planes that glow with diffused light in the interior during the day and on the exterior at night. This simple direct building form is complimented by the flexibility of its program and the dynamic nature of its enclosing skin. Alternatives to conventional products and intelligent use of traditional, low cost materials, and in particular new development with plastics in the form of foams, films and sheeting, has allowed us to build lighter and more cost effectively. To achieve a quality of lightness, transparency and translucency we will employ ETFE foil sheeting, polycarbonate wall extrusion, cellulose corrugated insulation, glass fiber reinforced fabrics, PVC sheeting and a synthetic polygon playing field to achieve a lightweight, durable and low maintenance building. Pier 5 Recreational Building Brooklyn images / information from James Carpenter Design Associates Inc.